Have you ever wondered how straighter teeth could help you? You might be surprised by the answer. Besides improving the appearance of your smile, straighter teeth can also enhance your confidence, strengthen your relationships with others, and improve your oral health. What’s more, you can do all that without ever wearing traditional braces. That’s because, at Dr. Byron McKnight’s dental office in Mesquite, we offer Invisalign--one of the leading producers and providers of clear braces. Instead of using metal brackets and wires the way traditional braces do, Invisalign relies on a series of clear, custom-made aligners. Beginning with your first aligner, you’ll wear each one for about two weeks before moving on to the next in the series, with one each bringing your teeth closer and closer to their ideal position. The accuracy of your treatment with Invisalign will be due in part to the advanced planning that occurs beforehand. To create your treatment plan, Dr. McKnight will scan your smile with our Cadent iTero wand. Cadent iTero has brought dental impression into the 21st century. Instead of taking multiple impressions with messy, uncomfortable putty, we can capture detailed digital images of your teeth in just a matter of minutes. 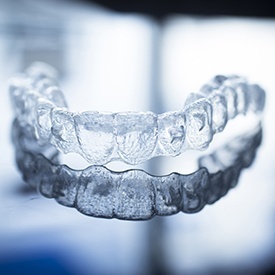 Then, once we’ve planned your treatment using your this impression, Dr. McKnight can send that plan to an Invisalign lab where your clear aligners will be carefully fabricated. 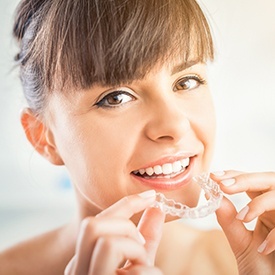 Besides being clear, there are other benefits to Invisalign that Dr. McKnight wants his Mesquite patients to know about. First, because Invisalign doesn’t use metal brackets and wires, fewer visits to Dr. McKnight’s office are required. That means fewer disruptions to your busy schedule and a more comfortable treatment. Second, your Invisalign aligners are removable. You can take them out to eat, brush, and floss. That means you never have to worry about cutting back on the foods you love, and you can take better care of your smile by brushing and flossing as thoroughly as you normally do. Traditional braces, by comparison, can make it hard to reach certain parts of your smile, making you more vulnerable to common oral health conditions like tooth decay and gum disease. But Invisalign ensures that you can thoroughly care for your teeth as your receive the orthodontic treatment you need. Do you want a straighter smile that will boost your confidence and enhance your professional image? Dr. McKnight can answer any questions you might have about Invisalign. Our patients from Mesquite and beyond don’t have to put their social and business lives on hold just to have straighter teeth. Instead, you can get the care you’ve always wanted right now, with greater convenience and comfort than you might have imagined.